Deep, ruby-red, medium-sized, full paeony-form flowers, occasionally showing white petaloids and stamens. Vigorous growth, forming an upright bush. Flowers in mid to late season (March - April). Originated by Les Jury in New Zealand, from a cross between C.japonica Kimberley and C.x williamsii Dark Nite, first flowering in 1987. Deep, ruby-red, medium, full paeony form, occasionally showing white petaloids and stamens. Vigorous, upright bush. Mid to late season flowering. Great service, was well packaged and protected. My parents love it and I was very pleased with the quality and size. 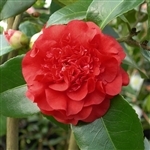 The Camellia was chosen for its special significance and didn't disappoint. The recipients were delighted with this gift in recognition of their Ruby Wedding Anniversary. A very healthy plant, it carried many buds ready to open and was delivered on the date requested. Fantastic service! The plant arrived well packaged and in good condition. It is now waiting in a sheltered position ready to give tomy husband on our Ruby Wedding Anniversary in a few days time. Thank you.